Pharmacovigilance as we know is a science with a set of pre defined functions to collect, analyse, monitor adverse event reports in understanding the safety profile of drug. The set pre defined functions would include case processing through data entry of adverse event forms into safety database, medical review, aggregate reporting, signal detection, risk evaluation and mitigation strategies. With patients awareness and regulatory compliance we may have seen a surge of adverse event data over last few years , resulting in the urgent need for the application of automation. Pharmacovigilance is the only discipline where in which timelines and quality data are evaluated on a benchmark of 100 % and a compromise in these two parameters are considered to be a zero tolerance. Automation of above pre defined function is possible through machine learning, which is an integral components of Artificial Intelligence. Artificial intelligence may be called as an ability of a computer system to perform task that require human intelligence such as cognition through visual acuity, voice recognition, language translation leading to decision execution of a certain function. Machine learning is based on reinforced data, where in which when an algorithm is executed to accomplish a specific task. If it accomplishes the algorithm ends and the entire procedure in auto stored in the program, which means next time one does not need to manually execute the program, it would be auto executed in order to accomplish the task, if presented with the exact same variables as that of the earlier scenario. This process self-learning through experience is called machine learning. 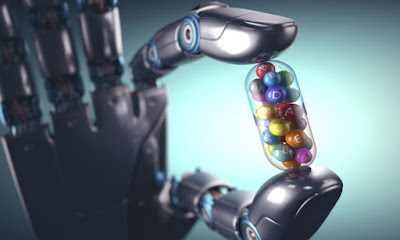 An algorithm created on the principle of machine learning would have the capability to auto recognises and identify the suspect drug from concomitant therapy, adverse event from medical history and not only this through robotic process automation it may integrate the email with safety database, which means not only it identifies the suspect drug and the adverse event, it now also does the auto data entry, prepares auto case narrative and auto sends letters to the patient or physician for further follow up from the safety database. This is ‘Artificial Intelligence’, a capability attained through self-learning to process thousands of data within seconds. With automation employees engaged in manual data entry would be upskilled in the execution of AI process.